The politics of globalisation and development; displacement; gender and sexuality rights; Indigenous people; peace and conflict; queer studies. Bitopi got her B.A in Sociology from Lady Shri Ram College for Women, Delhi University (2010) and her Masters in Social Work from Tata Institute of Social Sciences, Mumbai (2012). She worked as a research associate in North Eastern Social Research Centre in Guwahati, development induced displacement in India and traditional method of conflict resolution in tribal indigenous societies. 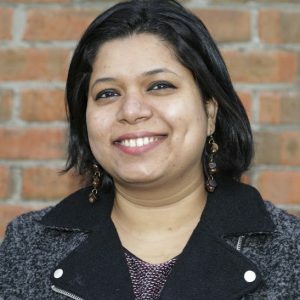 Apart from working as a free launch researcher on gender and sexuality studies undertaken in the region, Bitopi has been closely associated with gender and queer activism in India and co-founded the first queer collective called Xukia in the state of Assam. She is also in the editorial team of the very first queer zine of the region called “Forbidden” published quarterly by Xukia. Bitopi’s work deals with how development induced displacement reorders gendered relationships in tribal matrilineal societies. It analyses how patriarchy engrained in modern development discourses intersects with the discourse of customary rights of indigenous tribal societies leading to a massive gendered reordering of indigenous societies. Focusing on the state of Meghalaya of North East India, the study contextualises the case to three matrilineal tribes of the region in the light of the displacement caused by the coal mining activities in Meghalaya.